REpose Gallery is unique to River East Art Center, exclusivley representing River East Art Center's resident artist community. 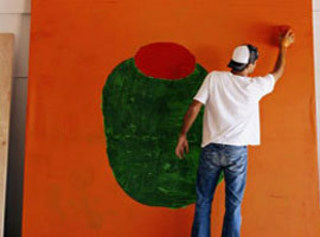 When you visit REpose you will have the opportunity to see the artist create artwork in their on-site studios. The Gallery hours are Monday - Friday 8:30am-5pm and Saturday and Sunday by appointment only. The Gallery is located at 435 E. Illinois on the lower level of River East Art Center in the East Flats. Tour groups are welcome. Please call to schedule your custom tour, including meeting our resident artists!